Catchword Releases Its New "Name Visualizer"
OAKLAND, CA--(Marketwire - October 13, 2010) - How do you judge potential brand name candidates when all you have is a list of names on a piece of paper? Now marketers have a free new online tool at their disposal. 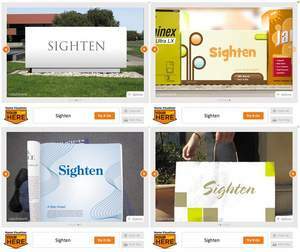 Developed by the brand naming company Catchword, Name Visualizer lets marketers view name candidates in six real-world marketing scenarios, from a business card to a billboard. Users can simply type a name in, try it out in various colors, sizes, and fonts, and drag it around within different marketing settings. The proprietary tool was inspired by Catchword's own experience contextualizing brand name candidates in order to help clients evaluate their product naming or company naming choices. And if the naming company's experience is any indication, the need for such a tool is widespread. "Even the most savvy marketing people can have a hard time visualizing how a name will come across in real life," observes Laurel Sutton, Catchword co-founder. "But it's a crucial component, because a brand name will never exist in a vacuum." Unlike typical software design programs, the intuitive tool requires no training. "You just plug a name in and take it for a spin," says Sutton. "By concretizing each name, Name Visualizer makes it much easier to gauge its true potential." According to Sutton, brand names that might be dismissed as too "out there" often gain power and plausibility when put into visual context. By the same token, names that look impressive on paper may be emotional duds when contextualized. So if you're naming a company or product, you just might want to put your ideas to the test -- and visualize them. Catchword is a full-service brand naming company that's created successful brand names for Fortune 500 companies -- and many others -- since 1998. For more information, visit http://www.catchwordbranding.com, or contact Laurel Sutton, 510-628-0080 x105 / laurel [at]catchwordbranding [dot]com. Or catch Laurel's latest Fast Company column.